A legal document which sets out the terms of the contract. Bosco Accounting provides content on our websites (www.boscoaccounting.com.au) subject to the following Terms and Conditions. We may periodically change the terms and conditions, so please check back from time to time. By accessing and using this site, you agree to these terms and conditions. For an explanation of our practices and policies related to the collection, use, and storage of our users’ information, please read the information under Privacy on this site. All content and functionality on the site, including text, graphics, logos, icons, and images and the selection and arrangement thereof, is the exclusive property of Bosco Accounting Pty Ltd Pty Ltd and is protected by Australian and international copyright laws. All rights not expressly granted are reserved. The trademarks, service marks, designs, and logos (collectively, the ‘Trademarks’) displayed on the site are the registered and unregistered Trademarks of Bosco Accounting Pty Ltd. Unless otherwise indicated on the content, you are authorised to view, copy, print, and distribute (but not modify) the content on this Website; provided that (i) such use is for informational, non-commercial purposes only, and (ii) any copy of the content that you make must include the copyright notice or other attribution, if any, associated with the content. You are not authorised to copy or use any software, proprietary processes, or technology embodied in this Website. You acknowledge and agree that Bosco Accounting Pty Ltd shall own and have the unrestricted right to use, publish, and otherwise exploit any and all information that you post or otherwise publish on the site in postings, survey responses, and otherwise, and you hereby waive any claims against Bosco Accounting Pty Ltd for any alleged or actual infringements of any rights of privacy or publicity, moral rights, or rights of attribution in connection with Bosco Accounting Pty Ltd use and publication of such submissions. Bosco Accounting Pty Ltd does not and cannot review all information posted to the site by users and is not responsible for such information. However, Bosco Accounting Pty Ltd. reserves the right to refuse to post and the right to remove any information, in whole or in part, for any reason or for no reason. While we have made every attempt to ensure that the information contained in this site has been obtained from reliable sources, Bosco Accounting Pty Ltd is not responsible for any errors or omissions, or for the results obtained from the use of this information. All information in this application is provided “as is”, with no guarantee of completeness, accuracy, timeliness or of the results obtained from the use of this information, and without warranty of any kind, express or implied. In no event will Bosco Accounting Pty Ltd , its related partnerships, agents or employees thereof be liable to you or anyone else for any decision made or action taken in reliance on the information in this application or for any consequential, special or similar damages, even if advised of the possibility of such damages. Your access to and use of the Bosco Accounting Pty Ltd website is subject exclusively to these Terms and Conditions. You will not use the website for any purpose that is unlawful or prohibited by these Terms and Conditions. By using the website you are fully accepting the terms, conditions and disclaimers contained in this notice. If you do not accept these Terms and Conditions you must immediately stop using the Website. Bosco Accounting Pty Ltd will never ask for credit card details and request that you do not enter it on any of the forms on the Bosco Accounting Pty Ltd website. Bosco Accounting Pty Ltd website may include links to third party websites that are controlled and maintained by others. Any link to other websites is not an endorsement of such websites and you acknowledge and agree that we are not responsible for the content or availability of any such sites. 5.1 All copyright, trademarks and all other intellectual property rights in Bosco Accounting Pty Ltd website and its content (including without limitation the website design, text, graphics and all software and source codes connected with the Website) are owned by or licensed to Bosco Accounting Pty Ltd or otherwise used by Bosco Accounting Pty Ltd as permitted by law. 5.2 None of the content may be downloaded, copied, reproduced, transmitted, stored, sold or distributed without the prior written consent of the copyright holder. This excludes the downloading, copying and/or printing of pages of the Website for personal, non-commercial home use only. 6.1 Bosco Accounting Pty Ltd website is provided on an AS IS and AS AVAILABLE basis without any representation or endorsement made and without warranty of any kind whether express or implied, including but not limited to the implied warranties of satisfactory quality, fitness for a particular purpose, non-infringement, compatibility, security and accuracy. 6.2 To the extent permitted by law, Bosco Accounting Pty Ltd will not be liable for any indirect or consequential loss or damage whatever (including without limitation loss of business, opportunity, data, profits) arising out of or in connection with the use of the website. 6.3 Bosco Accounting Pty Ltd makes no warranty that the functionality of the website will be uninterrupted or error free, that defects will be corrected or that the Website or the server that makes it available are free of viruses or anything else which may be harmful or destructive. 6.4 Nothing in these Terms and Conditions shall be construed so as to exclude or limit the liability of Bosco Accounting Pty Ltd for death or personal injury as a result of the negligence of Bosco Accounting Pty Ltd or that of its employees or agents. You agree to indemnify and hold Bosco Accounting Pty Ltd and its employees and agents harmless from and against all liabilities, legal fees, damages, losses, costs and other expenses in relation to any claims or actions brought against Bosco Accounting Pty Ltd arising out of any breach by you of these Terms and Conditions or other liabilities arising out of your use of this website. The contents of Bosco Accounting Pty Ltd website do not constitute advice and should not be relied upon in making or refraining from making, any decision. 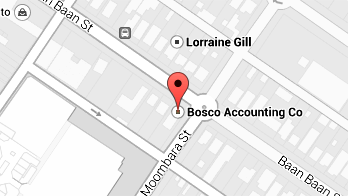 Copyright © 2013 Bosco Accounting Pty Ltd.